No Powers. 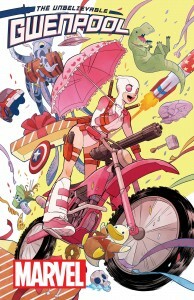 No Responsibility – Your First Look at THE UNBELIEVAVBLE GWENPOOL #1! Wait, really? Yes, really! 2015’s overnight sensation is slicing and dicing her way into hearts and minds as well as her very own ongoing series! 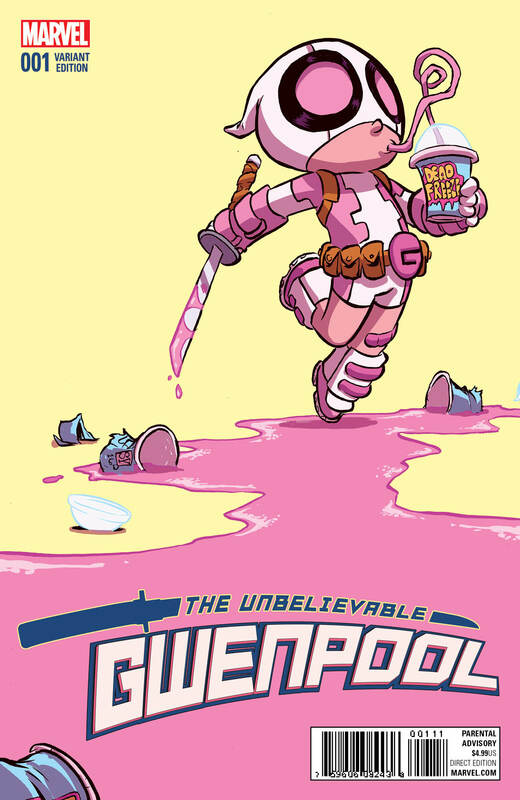 Hold on and hang tight world, because she’s THE UNBELIEVABLE GWENPOOL – and her first issue is coming at you this April from writer Christopher Hastings and artist Gurihiru! Gwen Poole used to be a comic book reader just like you…until one day she woke up INSIDE the Marvel Universe. Now all the characters she read about are real! But they can’t be really real, can they? This has got to be some kind of dream or something, right? Well you know what that means – NO CONSEQUENCES! First order of business, get a costume and start fighting crime. Why? Because that’s what everyone who has a solo series does! No power. No responsibility. No rules. No limits. The Marvel Universe has a new player, and she’ll shoot and stab her way through anyone and everyone. 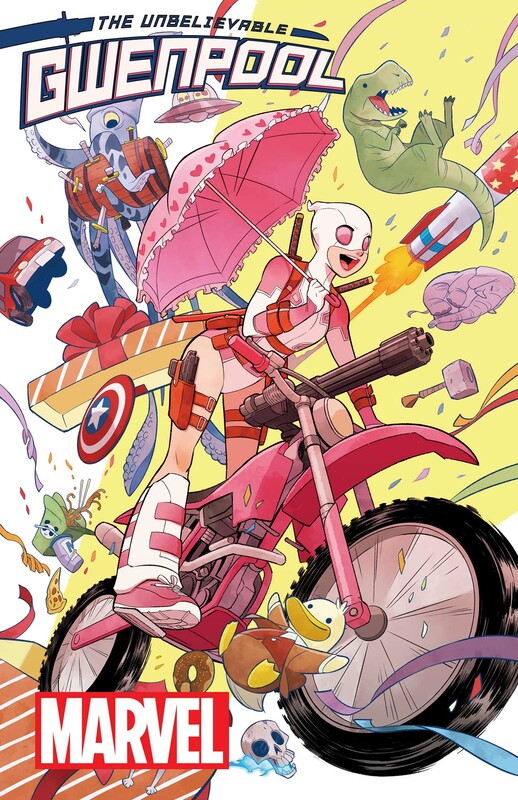 Could she truly be Marvel’s least role-modely and least responsible character to date? She can if she tries! 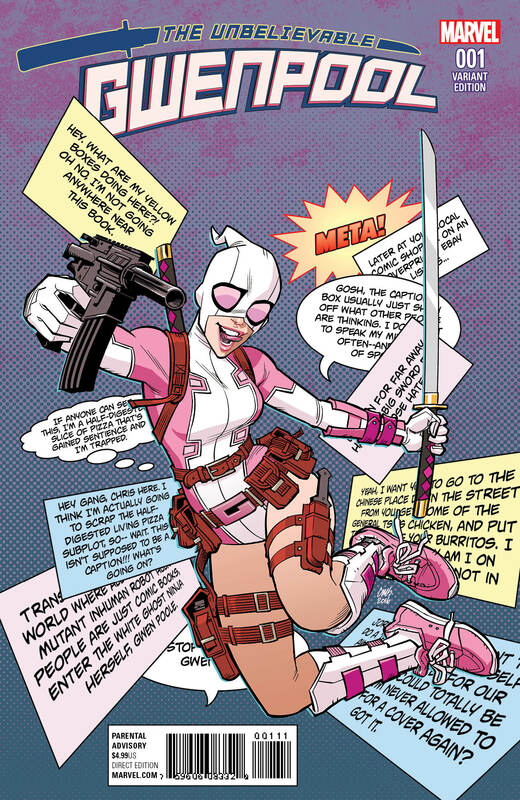 Find out this April as this marvelous mercenary makes her explosive entrance in THE UNBELIEVABLE GWENPOOL #1! 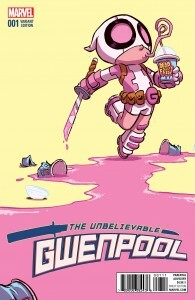 THE UNBELIEVABLE GWENPOOL #1 : Written by CHRISTOPHER HASTINGS, Art & Cover by GURIHIRU, Variant Covers by FRANCISO HERRERA, STACEY LEE, CAMERON STEWART and SKOTTIE YOUNG . Hip-Hop Variant by WOO DAE SHIM & Action Figure Variant by JOHN TYLER CHRISTOPHER.